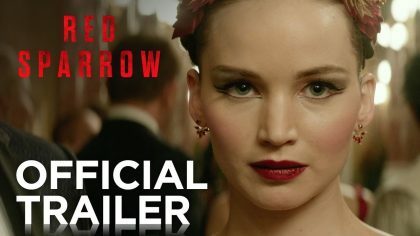 Watch the trailer for spy thriller ‘Red Sparrow’ starring Jennifer Lawrence as a Russian ballerina recruited into espionage. Watch the movie review of Darren Aronofky’s mother!, starring Jennifer Lawrence, Javier Bardem, Ed Harris and Michelle Pfeiffer. Watch the trailer for Darren Aronofsky’s thriller Mother, starring Jennifer Lawrence and Javier Bardem. Jennifer Lawrence, Josh Hutcherson and Liam Hemsworth bring ‘The Hunger Games’ franchise to its final chapter. Lionsgate has released a new The Hunger Games: Mockingjay – Part 2 movie poster featuring Katniss in her red battle suit. Jennifer Lawrence and Bradley Cooper’s marriage begins to unravel in Depression-era North Carolina.